UK Tier 4 Student Visa General is for those students who want to study in UK for post 16 education. There are a large number of noted Universities and colleges to choose from. If you are more than 16 years and intending to do study course at an acceptable level, generally level 3 under National Qualification Framework, you can apply under Tier 4 category. For Tier 4 child category you need to get sponsors approval. If you want to study English as foreign language, you should apply for Tier 4 Student General Visa. Tier 4 Student Visa General allows you to stay and study in UK temporarily for full time of the course. UK Tier 4 Student Visa General allows you to work under limitations, depending on the level of study. Under UK Tier 4 Student Visa General, you can take your spouse if the course studies is 7 or above and the duration of the course is more than 12 months. You can take your spouse if the course comes under new government sponsored student and duration is 6 months. UK Tier 4 Student Visa General is Based point scored. You need to score 40 points. 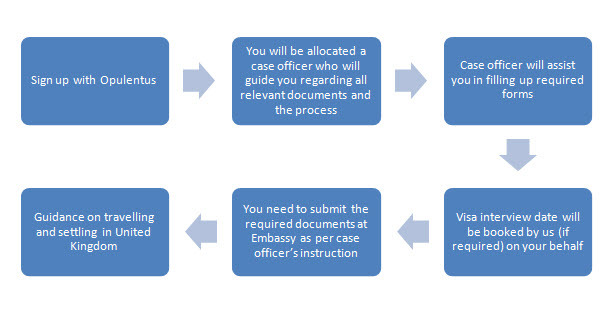 You can apply UK Tier 4 Student Visa General either from other countries or from inside UK. Once the client receives his/her UK Tier 4 Student Visa General, Opulentus offers services for hassle free travel and stay.